Marking its debut somewhere in 1960, Mini Cooper has commendably evolved itself and today stands as a fancy hatchback, overcoming its small economy car image. 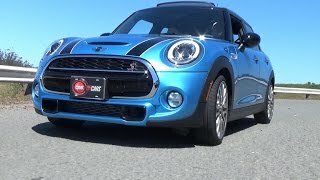 Gaining popularity in United States, for the year 2015 company has introduced its all new Mini Cooper 5-door 2015 with some great features, looks and powertrain options beneath the hood. 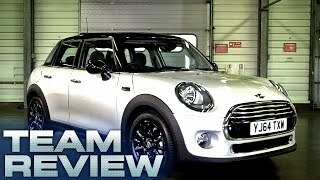 Let us have a close look at the review of Mini Cooper 5-door 2015 to know it better. Looking at the interior of Mini Cooper 5-door 2015 you’ll notice lot of legroom, headspace and in luggage compartment. Adding to the same feature, rear seats can further be folded and thus offering you increased space for your luggage. Designed in black the interior looks elegant with a three-spoke steering wheel mounted over the neat dashboard. Apart from its space adding to your comfortable long rides are the leather upholstered seats. Door panels too get some unique and attractive design features with metallic finishing marking glory over them. Same accents can also be noticed at the sides of dashboard while the center features a massive eye-like design offering major controls beneath it. Exterior of Mini Cooper 5-door 2015 carries the legacy of traditional hatchbacks from the company, however some changes have been inculcated. 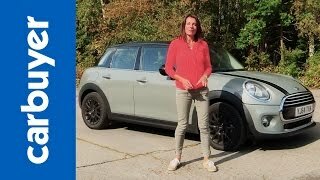 This all begins with the elongated body that carries sportier looks resembling to three-door version and thus together bringing looks of station wagon to this all new Mini Cooper 5-door. We personally found a drawback in this new version and this is linked with the rear-doors which are almost half in size when compared to front doors. 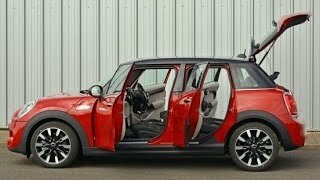 So if you are going for Mini Cooper 5-door 2015, few of your fellow travelers might find it difficult to board in rear compartment of Mini Cooper 5-door. Apart from this the sportier model rolling over the dual-tone wheels covered by black arches looks very attractive. The Mini Cooper 5-door 2015 has been created to come in four variants, including two petrol and two diesel engines. However for US market only Petrol engines will be available, this includes; 1.5 Liter 3-cylinder engine delivering total output of 136 hp and peak torque of 220 nm paired to six-speed manual transmission as standard, however company provides option to switch for the automatic version. With its manual gearbox Mini Cooper 5-door reaches 0-60 mph in 7.6 seconds, maintaining top speed of 129 mph. Second variant for US market will be a 2.0 liter 4-cylinder engine generating 192 hp and peak torque of 280 nm paired to same transmission level. 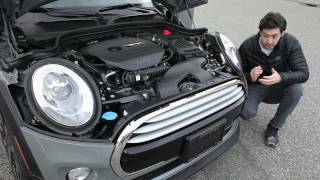 With its power statistics the Mini Cooper 5-door reaches 0-60 mph in 6.6 seconds while top speed stands at 145 mph.